Grown on the slopes and valleys east of the Soane in the Burgundy Region in the East of France, the red Burgundies are perhaps known best as dry red wines made from the Pinot Noir grapes. Unlike Bordeaux, which is classified by producer, Burgundy is classified by origin. There are over 400 different types of soil in the Burgundy region, which is why great attention is paid to the wine's origin. The classification of Burgundy wines is made up of over 150 AOC classifications with the highest being of Grand crus like Montrachet or Corton and secondly Premier crus like Volnay down to wines of specific styles. 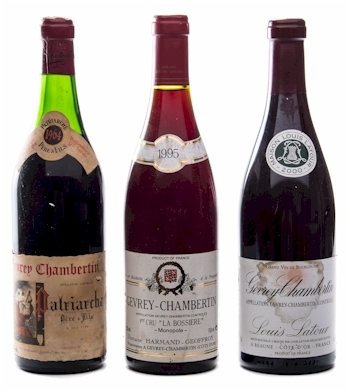 Vintage bottles of Red Burgundy Wine from Gevrey-Chambertin.